Undoubtedly, Ugandans have lost faith in the current regime. My conversation with a boda boda man on Saturday as I went to the market nailed this truth for me. As we rode down the dusty road, I asked him whether the heap of gravel stones we had by passed were meant to tarmac it. His giggle made me feel like I was stranger in town. ‘Make the road?’ He chuckled. ‘Yes make the road.’ I then asked him whether this was a KCCA road and he confirmed that it was.I labored in vain to inform him that KCCA had embarked on a project to tarmac all roads in the suburbs; I even cited the example of the Kisasi- Bukoto road that is under construction after being dilapidated for very many years but all this effort produced no fruit. He told me that he would believe only after seeing the construction complete. ‘We are like a woman stuck in a bad relationship’ I said ‘Well even if they make the road, they will be looking for a way to steal some money.’ he assured me. I had reached my destination, but the bad relationship bit stuck in my mind. I am convinced that many Ugandans would relate to the allusion. The boyfriend that presents angelic traits only to discover that there is a devil incarnate that lies beneath. What choice do you have when faith in him is gone? Break up- yet in this case that is not a choice because he is the possessive type, who claims that he not only loves you very much but that he is the only one with a plan for you- so, he is justified to abuse and constantly remind you of your ingratitude especially after rescuing you from a bad relationship. In his own evaluation, he is better than the swine that came before him. 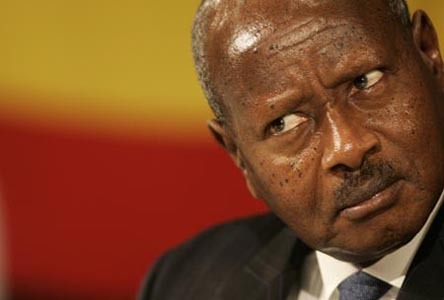 Every time the President of the Pearl of Africa stands up to deliver his S.S.T lesson on days like independence day, NRM day, and heroes day, he reminds us about the policies and reforms that have helped change things since 1986, but what has changed? Is it the corruption scandals that come up everyday and have boosted Uganda to the number-one spot in East Africa? or is it he reforms in the labor market where there is continued increase in levels of unemployment and substantial underemployment that has left very many youth frustrated after working so hard in school. Is the change in the electoral process that saw some Ugandans exchange their freedom for a piece of soap? or maybe it is the nepotism and the terrible theoretical education system and the endless list of problems; the abuse of the constitution, the dilapidated infrastructure, appalling healthcare system, low salaries for civil servants, the ghosts in almost every sector? this indeed is a bad relationship or is it a marriage. This relationship is so sour that it has smothered even the little nostalgia that I used to hang onto. When I was a child, I looked forward to Heroes day because that is the only chance I got to hear the song; ‘Oh Uganda, we celebrate Oh Uganda we celebrate with Yoweri Museveni the proper son of Africa.’ And especially the proper son of Africa bit.